Healthcare-associated infections, such as ventilator-associated pneumonia (VAP), are the most common and most preventable complication of a patient’s hospital stay. Their frequency and potential adverse effects increase in critically ill patients because of impaired physiology, including a blunted immune response and multi-organ dysfunction. Traditionally, VAP rates have been measured as an indicator of quality of care. Despite recent initiatives to measure complications of mechanical ventilation and a decrease in incidence over the past few years, VAP remains an issue for critically ill adults, with mortality estimated as high as 10%. This article reviews the top five evidence-based nursing practices for reducing VAP risk in critically ill adults. The most important evidence-based practice for lowering VAP risk is minimizing a patient’s exposure to mechanical ventilation, which can be achieved in two ways. First, encourage and advocate for the use of noninvasive ventilation approaches, such as bilevel positive airway pressure or continuous positive airway pressure. The face masks used with these approaches can be uncomfortable for patients, but data from a small randomized clinical trial suggests that similar benefits can be achieved using a helmet instead. In addition to better patient comfort, helmets resulted in a significantly lower intubation rate compared to face masks. Second, when mechanical ventilation can’t be avoided, work to minimize its duration. Ventilator-weaning protocols or evidence-based care bundles (for example, the Awakening, Breathing Coordination, Delirium, and Early mobility [ABCDE] bundle) can be effective in shortening mechanical ventilation duration. Nurse-led and respiratory therapist–led ventilator-weaning protocols that include daily interruption of sedation and coordination with a spontaneous breathing trial have been effective in removing patients from mechanical ventilation quickly and appropriately. If a ventilator-weaning protocol doesn’t exist on your unit, take the opportunity to design and develop one. Oral health quickly deteriorates in mechanically ventilated patients. Some patients sustain injuries to the oral mucosa during the intubation procedure, and after intubation, patients are prone to dry mouth. These factors, in addition to a severely compromised immune system, can cause an increase in bacteria colonization in the oral mucosa, with the endotracheal tube serving as a direct route to the lungs. Adequate oral care can reduce bacterial overgrowth and reduce the risk for infection. In a meta-analysis of more than 18 randomized controlled trials (RCTs), routine oral care with chlorhexidine reduced the incidence of VAP. Currently, no guidelines exist for oral hygiene frequency. A recent systematic review of 38 RCTs showed oral care being performed anywhere from one to four times a day. Making oral care a routine part of a patient’s assessment in the intensive care unit (ICU) is one way to enhance its frequency. Consider developing a unit-specific protocol with clear articulation of roles and responsibilities. Aspiration of secretions that accumulate around a mechanically ventilated patient’s endotracheal tube can lead to VAP. Subglottic secretion suctioning can be performed by both the nurse and respiratory therapist to help prevent aspiration and subsequent VAP. A recent meta-analysis of 20 RCTs found that subglottic suctioning reduced the risk for VAP by 45% compared to patients who didn’t receive this suctioning. Coordinating subglottic suctioning when conducting oral care may be a good way to cluster care and ensure both practices are routinely delivered. To reduce gastric reflux and aspiration, which can lead to VAP in mechanically ventilated patients, keep the head of the bed elevated between 30 and 45 degrees (semirecumbent position). Early mobility can be challenging, but it results in more ventilator- free days. Evidence supports the feasibility of early mobilization for critically ill patients, even shortly after intubation, as long as the patient isn’t sedated. Early-mobility protocols include a progressive approach that transitions from dangling at the edge of the bed, to standing at the edge of bed, to marching in place, and then, for patients who can tolerate a higher level of activity, ambulating. For the best patient outcomes, coordinate exercise and mobilization with physical and occupational therapists. Adequate nurse staffing in the ICU, especially for mechanically ventilated patients, can help minimize VAP risk. It provides nurses with the time, opportunity, and resources to implement care practices that reduce risk, and it allows them to spend more time with their patients, which may lead to early identification of VAP and prompt treatment. Healthy work environments and interprofessional collaboration have been associated with lowering the risk for VAP. 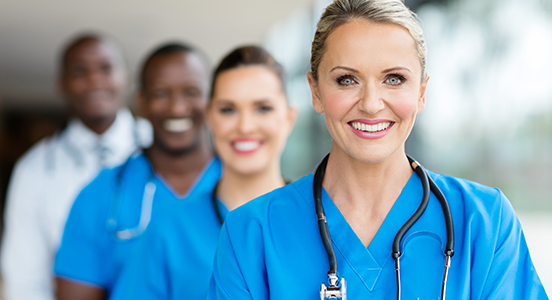 Two studies found that better nurse work environments, in conjunction with physician staffing, have implications for VAP risk. For example, in open ICUs where patients are managed by general physicians instead of specially trained critical care physicians, good nurse work environments can reduce VAP rates for mechanically ventilated patients. Similarly, when nurses work in environments that support professional nursing practice (healthy nurse work environments), they are significantly less likely to report frequent VAP. These data provide support for you to collaborate with other nurses to ensure a supportive work environment. For example, develop shared governance models, engage in quality-improvement activities to enhance high-quality care, and encourage positive team interactions. Partnering with ICU physicians and the rest of the interprofessional team, especially respiratory therapists, is key to encouraging positive team interactions and reducing VAP risk. Nurses are particularly well positioned to lead the healthcare team in VAP prevention. You can help minimize patients’ exposure to mechanical ventilation, work collaboratively to develop a ventilatorweaning protocol, and ensure implementation of evidence-based care that minimizes VAP risk.